Bridge building is one of the clearest and most eye-catching examples of the work that engineers do. The development of bridge design maps closely to technological, economic and social development and the development of interconnected societies; yet even as long ago as Roman times, engineers have been capable of building bridges at awe-inspiring scales. The bridge building theme gives teachers the opportunity to teach about the application of Science, Mathematics, and Design and Technology. 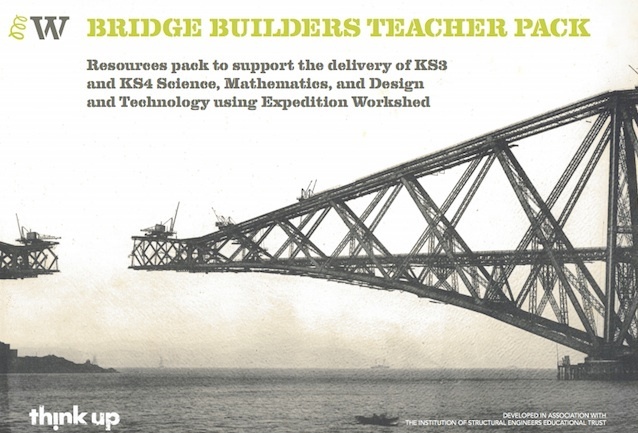 The Bridge Builders Teacher Pack teacher pack, developed by Think Up with the support of the Institution of Structural Engineers’ Education Fund, gives guidance on how to use the resources on Expedition Workshed to base lessons and learning activities around the bridge building theme. The activities are designed to be exciting and memorable, allowing students to use Workshed to access a range of interactive resources. The resource pack contains two core workshops, together with suggestions for complimentary activities that can be either used in isolation or in support of the workshops. The Bridge Builders Teacher Pack is an open educational resource.